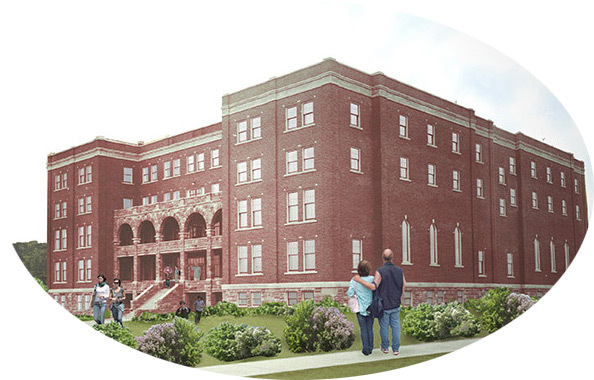 In Marquette Michigan, The Grandview Marquette is an affordable apartment complex that transforms the historic Holy Family Orphanage using state of the art energy efficient technology to create modern housing options for the Marquette community. The former Holy Family Orphanage, a vacant and blighted presence in the City of Marquette’s downtown since 1981, will be transformed as the Grandview Marquette by late summer of 2017. Community Action Alger Marquette is partnering with HRS on the redevelopment. Supporting the project are Marquette architect Barry Polzin, and Wolverine Building Group as general contractor. Constructed in 1915, the building is listed on the National Register of Historic Places. Many of the structure’s historic features, including its landmark sandstone multistory front porch, will be preserved during the renovation, and the building’s original chapel will be restored for use by residents as community space. Of the complex’s 56 units, 14 will be set aside as supportive housing units for formerly homeless persons and families in need of some level of support for successful occupancy; these units will be rented by eligible tenants with rents limited to 30 percent of their current incomes. Community Action Alger Marquette will provide on-site services and coordination with community agencies for the supportive housing units. The 75,000-square-foot building at 600 Altamont St. in Marquette once housed some of the Upper Peninsula’s most vulnerable residents: orphaned children. Going forward in 2017, the structure will serve another critical need: providing affordable housing for area working families. The redevelopment of the former Holy Family Orphanage into Grandview Marquette will provide much-needed housing close to Marquette employers, schools and other necessary services. Please visit www.grandviewmarquette.com for more information.